>Man, I LOVE this issue. Working with Joe Young has been amazing. And Marty Ison’s cover this time just blows me away. I couldn’t stop staring at it the first couple days it was in my hands. And the writing! Whoosh! Amazing. 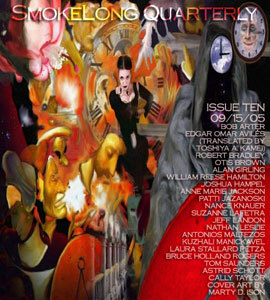 Stories by by Anne Marie Jackson, Bruce Holland Rogers, Nathan Leslie, Edgar Omar Avilés (translated by Toshiya A. Kamei), Jeff Landon, Cally Taylor, Joshua Hampel, Otis Brown, Kuzhali Manickavel, William Reese Hamilton, Laura Stallard Petza, Patti Jazanoski, Nance Knauer, Astrid Schott, Antonios Maltezos, Tom Saunders, Robert Bradley, Alan Girling, Bob Arter, and Suzanne Lafetra. Click the pic. You’ll be glad you did.